At Emerald Pacific Electric we use a straight forward pricing system. 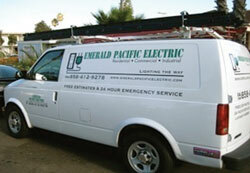 When you call us to your home or business to fix a problem we will arrive ready to tackle any electrical situation. Our electricians are highly experienced in diagnostic and repair work and our diagnostic fee is a flat rate regardless of how long it takes to identify the problem. Once the problem has been located, we will explain to you what it is and what options are available to you, most small repairs are even included in our diagnostic fee. If the situation involves a more detailed repair then we can give you an exact cost using our straight forward price guide, this means that you know the cost of the work being carried out and there are no hidden costs or surprises.